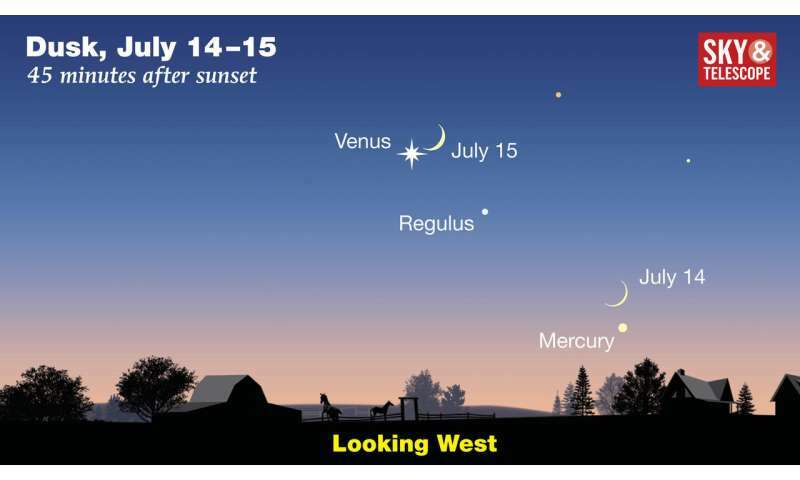 Soon after the Sun dips below the western horizon on Sunday, July 15th, anyone looking in that direction will see a dramatic sight: a pretty crescent Moon paired closely with the dazzling planet Venus, the "Evening Star." "You won't want to miss this," says Diana Hannikainen (pronounced huhn-ih-KY-nen), Observing Editor of Sky & Telescope magazine. "These are the two brightest objects in the nighttime sky." Start looking for the pair about 30 minutes after sunset. The farther west you are in North America, the closer they'll appear. From locations along the East Coast, they'll be about 2° apart—about twice the width of a finger at arm's length. 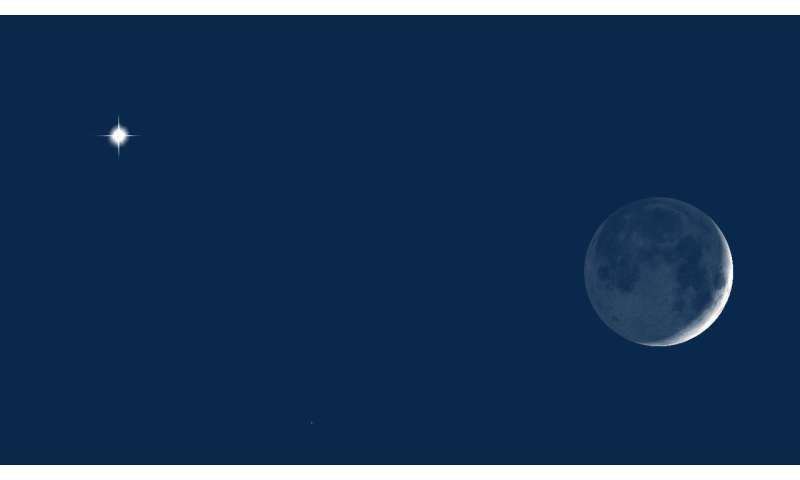 By the time darkness falls on the West Coast, however, the Moon will have edged closer—and the two will be just ½° apart (the Moon's apparent diameter). The pairing will look especially dramatic when viewed through binoculars or a backyard telescope at low magnification. Although this celestial duo might seem close together, they are not. The Moon, near the closest point of its orbit, will be 224,000 miles from Earth. But Venus, 88 million miles distant, is about 400 times farther away. Venus shines with a steady, unmistakable gleam. Often called the "Evening Star," it has been lingering above the western horizon after sunset for the past few months, and it will remain in view there through September. Seen through a telescope, the planet currently shows a tiny, football-shaped (gibbous) disk. Meanwhile, the Moon is only three days past new, so its crescent will look razor-thin. As the sky darkens, many people will see the dark, left-hand portion of the lunar disk filled in with a ghostly glow known as earthshine. That portion of the lunar landscape is dimly lit by the light of the nearly-full Earth high in the Moon's nighttime sky.